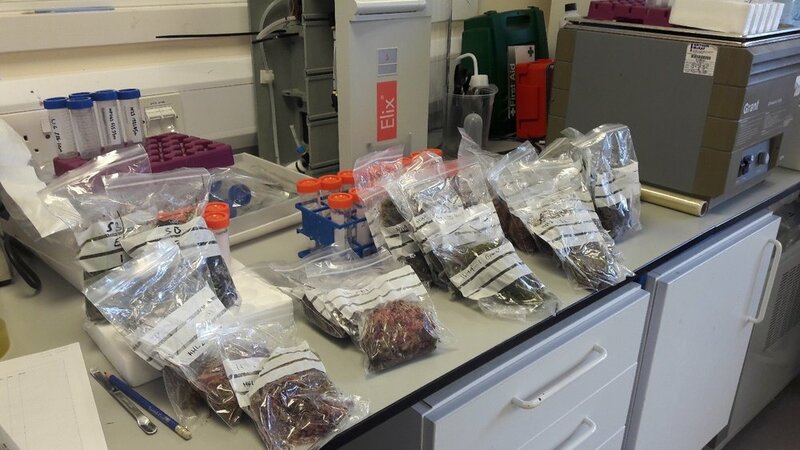 In 2016, ECT awarded a small grant to Althea Davies at the University of St Andrews to conduct pilot research on our Moor House LTE to assess the feasibility of using pollen and dung fungi as bioindicators of grazing. Here is her blog on what she found. Large animals take centre-stage in debates on rewilding, conservation and extinction, and have shaped many rural landscapes, from prehistory through to present. However, we have little empirical evidence for the extent to which herbivores act as ‘ecosystem engineers’ over the extended timescales that grazing interacts with climate change or slow ecosystem processes, like carbon storage and changes in tree cover. Long-term ecological methods, such as pollen preserved in waterlogged sediments, allow us to reconstruct vegetation dynamics on recent to millennial timescales, but there is a shortage of tools to quantify changes in the abundance of grazing animals in ways that are suitable for determining when they may be driving change and when they are a more passive component of ecosystems. Analysis of spores from fungi with an affinity for dung (coprophilous fungi) has emerged in the palaeosciences as an important independent proxy for understanding grazing dynamics, but this method has yet to be tested on peatlands. Given the importance of peat- and moorland systems for conservation, livelihoods, cultural heritage, climate change and as natural archives for palaeoecology, this is a significant gap. This project used the 40-60 years of grazing history at Moor House long-term ecological experiment (LTE) to quantitatively assess the relationship between grazing levels and two proxy bioindicators of herbivory: pollen and coprophilous fungal spores. The aim of the work was to assess whether it is possible to differentiate between grazed and exclosed experimental treatments, and to track the known changes in sheep density over the duration of the experiment using dung fungi. This was done by quantifying the abundance of pollen grazing indicators and coprophilous fungal spores in replicate surface mosses from both treatments at four locations across the NNR and in short peat cores from a grazed and exclosed plot at one site (pictured below). The results are not all straightforward, but raise important questions for further testing. Firstly, dung fungal spores are consistently more abundant than pollen indicators of grazing and therefore potentially provide a stronger proxy for local herbivory. This is not entirely surprising since mineral soils are scarce in peatland so niches for plants that are favoured by disturbance are limited. It was not possible, however, to differentiate between the two treatments using the dung fungi. This may be because fungal spores are dispersed beyond each fenced plot (which is comparatively small, at c.9 x 14 m). Alternatively, other herbivores, like grouse, which are not excluded by the fences, may be contributing to the dung fungi signal. Understanding such fundamental controls on fungal abundance is essential to develop quantitative indicators of herbivore dynamics. Both hypotheses are currently being tested in follow-up work at two further sites with larger grazed and exclosed areas. This study represents a novel use of a long-established experimental site as a bridge between ecology and palaeoecology. Without LTEs like Moor House it would be prohibitively expensive to set up a controlled grazing experiment to evaluate new methods. For updates, follow the project on ResearchGate or please contact Dr Althea Davies. The Ecological Continuity Trust is a charity that supports long-term experimental ecology in the UK, to advance better environmental management now and in the future.